Today we are cruising from Sitka, AK, to Victoria, British Columbia. 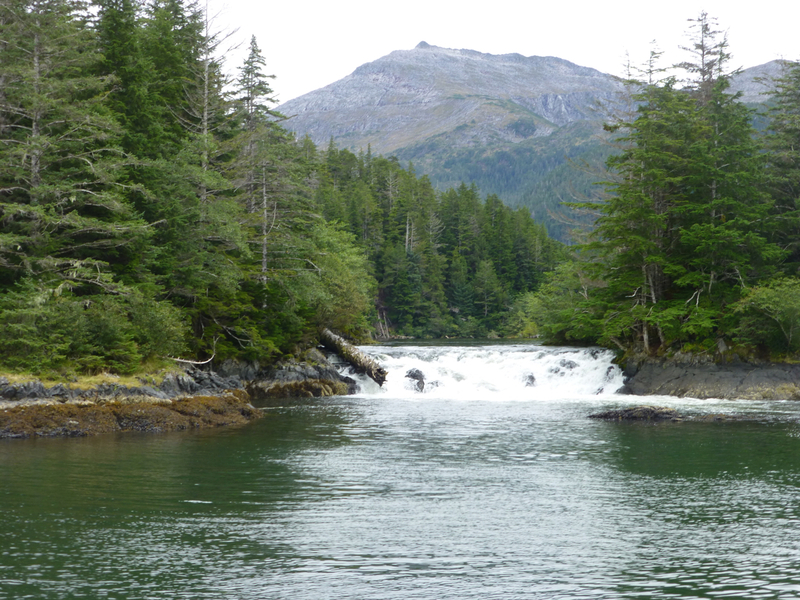 This day at sea allows me time to tell you about the shore excursion we took yesterday in Sitka. About 15 of us boarded a water jet catamaran ship, the Sea Otter Express, for a three-hour excursion entitled “Sea Otter & Wildlife Quest” in the area around Sitka. We weren’t gone too long before one of the two naturalists aboard directed our attention to the pointed noses of a couple of Steller sea lions. From then on we saw lots of local creatures. You can click on any photo here to see a larger version. Although the ship captain took us in as close as possible to view the wildlife without scaring them, we still had to use a telephoto lens for most of these shots. With the boat idling on the sea waves, we never had a completely stable base. Most of these photos will therefore be somewhat out of focus when viewed at larger sizes. Steller sea lions are named after naturalist Georg Wilhelm Steller, who first described them in 1741 while accompanying Vitus Bering on his explorations of the area around Alaska for the Russian government. These animals are big. An average female is eight feet (2.4 meters) long and weighs about 600 pounds (272 kg). An average male is 10 feet (3 meters) long and weighs in at 1,250 pounds (567 kg). Sea lions can be distinguished from seals by their larger size, their ear flaps, and their rotating rear flippers. In the water, sea lions project pointed noses, while seals present a round head, like a bowling ball. According to our trip brochure, the sea lion population around northern and western Alaska has plummeted by about 80% in the last 20 years. The probable cause of this decline is the overfishing of pollock, sea lions’ main food source. 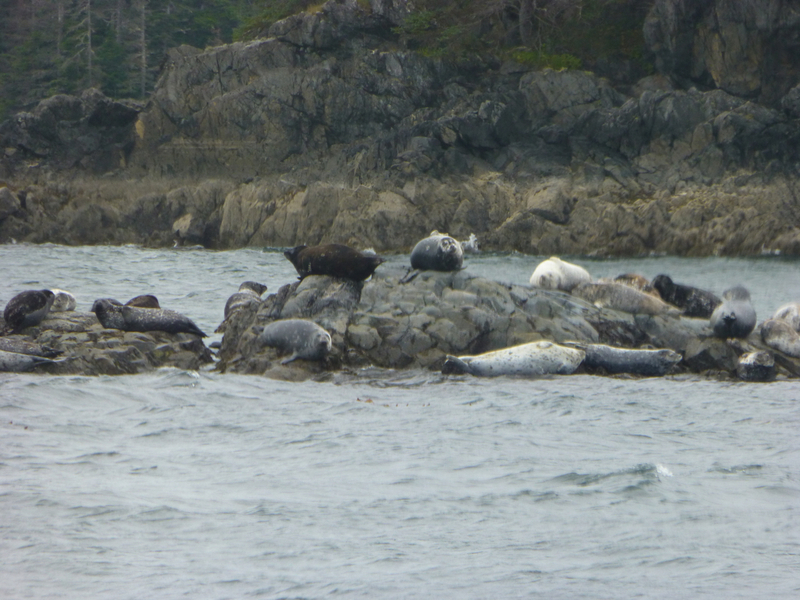 These harbor seals are stretched out on rocks getting some sun. Seals are smaller than sea lions. A typical harbor seal is about six feet (1.8 m) long and weighs about 180 pounds (81.6 kg). Seals flop around on rocks. 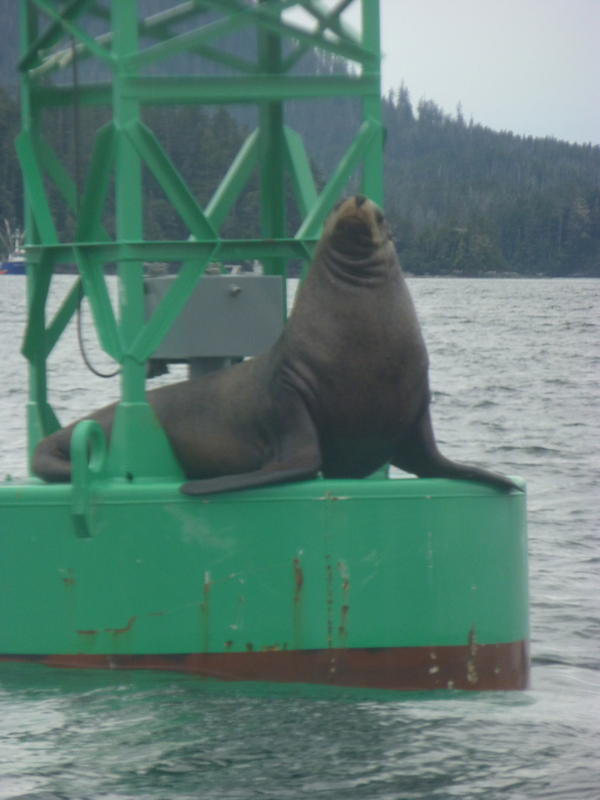 They cannot use their flippers to pull themselves up and stand, as the sea lion on the buoy in the photo above is doing. In the water seals swim along with their round heads just breaking the surface. Harbor seals have a thick layer of body fat to protect them from the cold water. Their coats consist of coarse, short hairs that can vary in color from blonde to nearly black. Many seals are spotted, streaked, or blotched. They can dive quite deep to catch the fish they depend on for food. Unlike seals and sea lions, most sea otters spend all their time in the water. An average male is five feet (1.5 m) long and 70 pounds (31.8 kg), while an average female is four feet (1.2 m) long and 60 pounds (27.2 kg). Unlike other sea mammals, sea otters do not have a fat layer to protect them from the cold water. They depend entirely on their thick, rich fur to keep them warm. Sea otters have an average of 300,000 hairs per square inch, the densest fur of any animal in the world. Because of their dense, soft fur, sea otters were hunted nearly to extinction in the late eighteenth and early nineteenth centuries. By 1911, only about 2,000 remained, widely scattered across the North Pacific. Restrictions on hunting and relocation programs have increased their number to about 150,000. In the 1970s a number of sea otters were brought to the area near Sitka from a distant point in the Aleutian Islands. 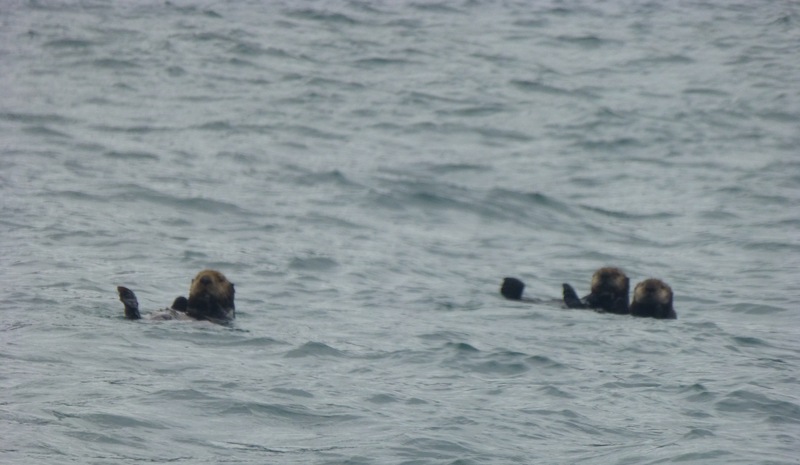 This repopulation program has increased the number of sea otters in the region to about 12,000 today. Sea otters are what is known as a keystone species—their presence or absence dramatically influences the environment. They eat invertebrates such as sea urchins, which can greatly reduce a region’s kelp supply, necessary for fish habitat, if left unchecked. Otters also eat abalone, clams, crabs, and octopuses. They can use rocks as tools to break open shells. They have a high metabolism and must consume about one-quarter of their body weight in food every day. Sea otters are very social but segregate themselves by gender. They hang out in groups called rafts; each raft will contain either all males or all females and pups. The males have no part in caring for the pups. 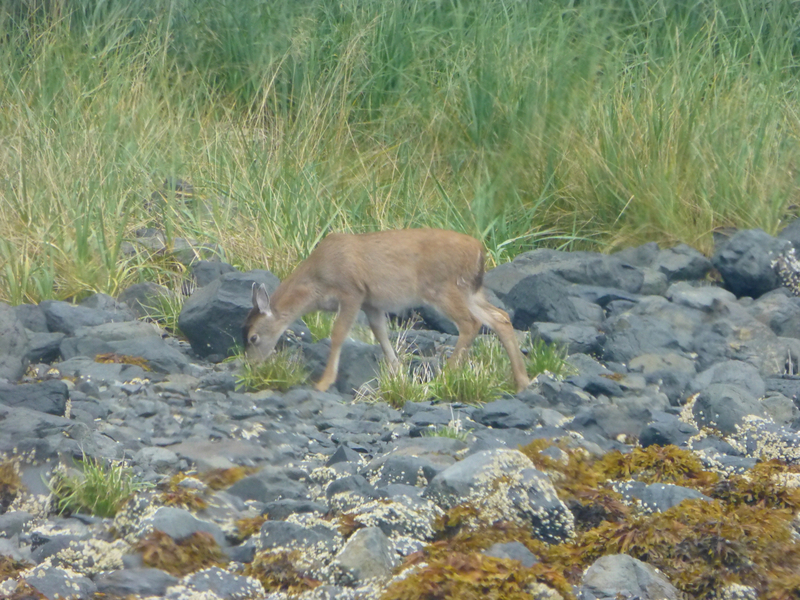 We were lucky enough to see a female Sitka black-tailed deer grazing along the shore. The captain of the boat spotted her and slowly took us in close enough to see her. She was well camouflaged against the shore, and most of us couldn’t see her until we get in quite close. These deer are quite small. An average male weighs about 120 pounds, an average female about 80 pounds. This one, though full grown, looked like a fawn to most of us. The naturalist told us that Sitka black-tailed deer are a hallmark of the old-growth forests that cover Alaska. The deer feed on the plants that cover the ground beneath the tall trees. When an area is logged, the deer disappear from the edge areas (the logged areas) deeper into the old-growth forest. These deer have also been known to swim from one island to another in search of food. Although they primarily eat vegetation, during the salmon run they may occasionally be seen eating fish, according to our naturalist. We didn’t get any photos of these black birds, but we saw several of them both flying and sitting in the water. They have long, curved necks and can dive deeply in search of the small fish they feed on. They have large feet that they use to paddle, like ducks, when resting in the water. Again, we weren’t able to get photos of these, but we saw several flying along the shore and out over the water in search of food. Their white heads are easy to spot against the green forests of the islands. Yes, lots. According to one of our naturalists, there are several different species of gulls in the Sitka area, and they ofter interbreed, producing difficult-to-identify hybrids. At spawning time the salmon will run up this waterfall to get back into the lake to spawn. I’ve saved the best for last, and so did our tour’s captain. After we had seen all the animals above, he headed further out to where he hoped we might be able to see a whale or two. It wasn’t long before the naturalist said, “I’m seeing quite a few blows up ahead. It’s unusual to see so many.” The blows are the jets of water visible when the whale exhales. That was the signal for us to head up top for a better view. And soon we were seeing the blows all over. We’d see three off to our right, then somebody would report two off to the left. I had planned to try to get some photos, but I was seeing so many exhalations that I just kept looking all around. My husband had his camera out and I could hear him shooting, so I just kept looking. 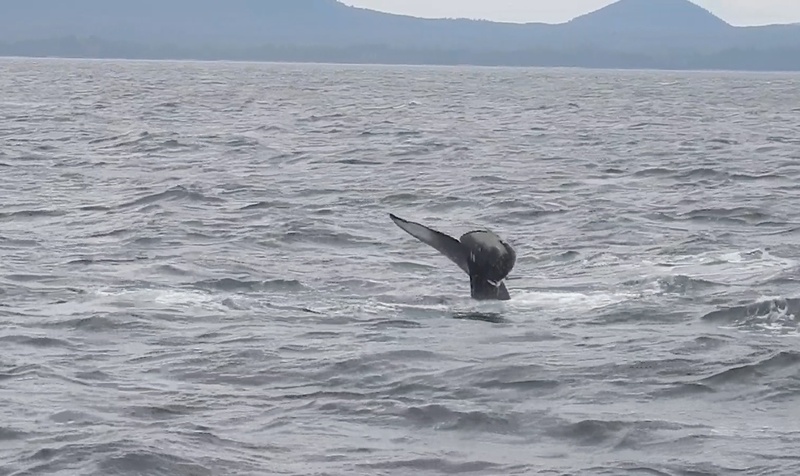 In the end, I saw 11 flukes, the usual signal that a whale is diving after spending time near the surface. We would see each group surface three or four times; then, one after the other, they’d rise up and show us their flukes. We had seen three humpback whales—two adults and a juvenile—on a whale-watching tour off the coast of Santa Barbara, CA, in late August of 2011. And back in about 1998 we had followed three or four orcas for a while on a small-ship cruise through the San Juan Islands off the coast of Washington State and Canada. But this was a truly magnificent display. The markings on the underside of a whale’s flukes are as distinctive as a human fingerprint. Researchers track whales by these markings. According to our trip brochure, scientists believe that more than 700 humpbacks inhabit the waters around southeastern Alaska. 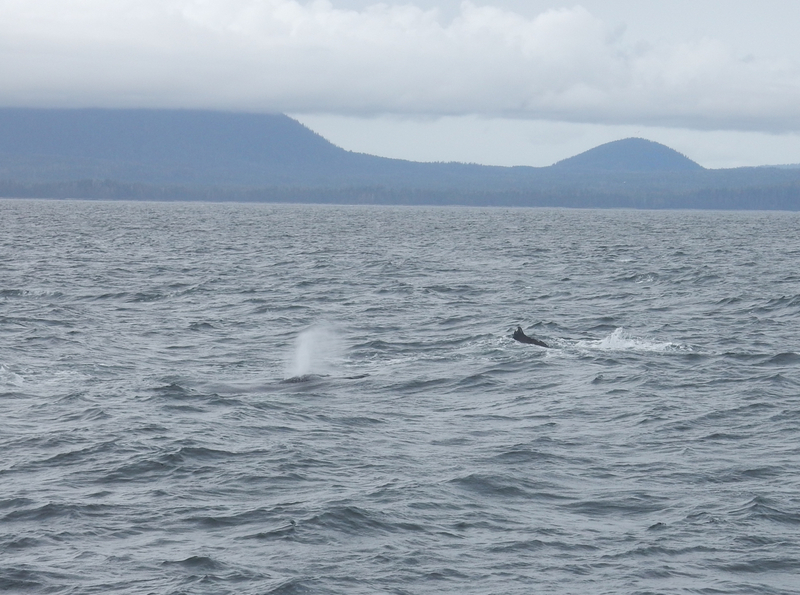 Our on-board naturalist explained that these whales were actively feeding. At the end of the summer they will migrate south, to the warmer waters around Hawaii or Mexico, to give birth. The whales must give birth in the warmer water because their calves are born without the layer of fat necessary for protection in colder waters. But the warm water doesn’t supply the kind of food the humpbacks need. They therefore eat heavily at the end of summer, and they may not eat at all again until they return north the next year.